Stratospheric aerosol consists of refractory and non-refractory (Murphy et al., 1998) material of varying chemical composition. It is dominated by sulfuric acid, representing the ultimate reservoir of sulfur transported from the troposphere into the stratosphere, and water. To understand and model the budget and variability of stratospheric aerosol and to quantify its radiative impact on climate, measurements of the particles chemical properties and concentrations of potential precursor gases, microphysical properties such as particle size distributions, as well as optical and radiative properties are necessary. In-situ measurements from balloons, research aircraft, and passenger aircraft are the only means to obtain data at high spatial and temporal resolution, and to obtain detailed information such as size distributions over the entire aerosol particle size range. The latter is particularly important during periods of low aerosol loading when measurements of aerosol integral properties (extinction, backscatter) by remote sensing instruments are limited at small particle sizes due to the atmospheric limitations on short wavelength measurements. Balloons are the only in-situ platform to reach altitudes of 20-30 km, which is a critical region for two reasons. First, it contains the top of the Junge layer that is controlled by sedimentation. Second, new particles are nucleated here from mesospheric material descending in the polar winter vortex and transported to mid latitudes, or from evaporation of stratospheric sulfate during sudden stratospheric warmings in the winter polar vortex and subsequent cooling during transport to lower latitudes. 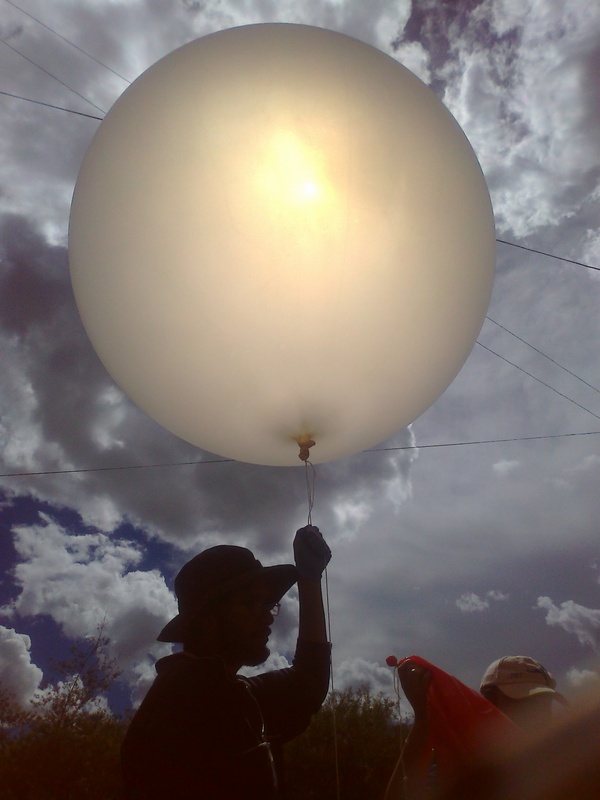 In-situ balloon measurements are also used to test and validate satellite measurements (WP3) of various aerosol optical properties, and provide one of the few unambiguous ways to derive surface area, particularly in regions and during time periods of low aerosol loading when remote sensors are not sensitive enough for reliable surface area estimates. The capability of global climate models to reproduce the impact on climate of stratospheric aerosol (WP5) is assessed by their capability to reproduce the size distributions and optical properties measured by long time series measurements. Small, simple and robust particle instruments ready for deployment on balloons provide a means for measurements in fresh volcanic plumes with consequences for WP4 and 5. The possibility to direct research aircraft into specific atmospheric regions and altitude regimes, coupled with a high sensitivity, selectivity and time resolution of in-situ techniques to measure trace gas concentrations and a wide range of aerosol parameters makes airborne field campaigns the perfect tool to study the chemical and microphysical properties of stratospheric aerosol and the dynamic, chemical and microphysical processes involved in their formation, transport and removal. These types of observations should be closely linked to or even driven by the process modeling activities described in WP4. Together, the dedicated field measurements and the process modeling improve our process understanding, which can then be implemented in global climate models (WP5). Most of the the process investigations outlined in the SSiRC white paper can only be addressed by aircraft reaching altitudes well above 15 km (cf. Figure 1) carrying a comprehensive aerosol, sulfur gas and tracer payload. Currently, only four aircraft worldwide (listed in Table A1) can reach the required altitude regime. The instrumental capacities needed to address specific science questions defined in the SSiRC white paper are defined in Table A2. Research aircraft can also be useful for the validation of satellite data products for specific objectives where routine ground-based or space-based instrument comparison is not adequate or even available, e.g. measurements across the tropopause where strong vertical gradients in many parameters exist. Data obtained by passenger aircraft are limited to the UT/LMS region (8-13 km flight altitude) and hence don't provide direct measurements of the stratospheric aerosol layer. However, these UT/LMS data are important for understanding extratopical strat-trop-exchange processes (WP4). Because of the large coverage and long-term measure ments, passenger aircraft provide statistically robust data sets, which can be used as input and validation parameters for global atmospheric models (WP5). It is important that the global models can correctly reproduce the aerosol relevant parameters at the border to the stratosphere, i.e. the UT/LMS. Finally, in-situ measurements of trace gases and aerosol parameters are the only source of data for validating remote sensing systems, both on ground (WP2) and satellites (WP3). Flights with the light aerosol counter (LOAC) in Europe in 2012-2015 to measure aerosol sizes between 0.4 and 100 m.
LOAC to participate in the CHARMEX project in 2012-2013. Bi-monthly size distribution measurements (condensation nuclei, 0.15 - 8.0 m) from Laramie, Wyoming, funded through 2015. Development of new optical particle counter for remote autonomous operation, 2012-2015, to extend the University of Wyoming instrument capability, and to provide an instrument for possible deployment on STRATEOLE phase 2 and in case of a major volcanic eruption. LOAC flights during various CNES balloon campaigns and during volcanic events. Proposed to CNES - AEROWAVE project. Increase flight frequency from Laramie for validation of aerosol products from the ozone mapper profiler suite (OMPS) satellite instrument. Possible proposal to NASA under negotiation. STRATEOLE phase 2 long duration balloons planned for the tropics focused on the TTL to address questions related to momentum, species, and particle fluxes across the TTL. [Albert Herzog, PI]. Both LOAC and the new Wyoming particle counter are planned for deployment during STRATEOLE phase 2. An overview of the ongoing or planned aircraft campaigns and other activities relevant to SSiRC are listed in Table 1. In particular with respect to relevant transport processes, useful information may also be obtained from past tropical missions, e.g. APE-THESEO (Seychelles, 2000), TROCCINOX (Brazil, Feb. 2005), SCOUT-O3 (Darwin, Nov. 2005), SCOUT-AMMA (West Africa, Summer 2006), TC4, TRACE-P. Efforts to at least link the observations from past and future missions on a central website will also be promoted within SSiRC in WP6. IAGOS uses passenger aircraft for regular in-situ measurements of trace gases, aerosol and cloud particles in the UT/LMS. These measurements are based on two approaches: IAGOS-CORE, where daily in-situ measurements of 5-8 trace gases, aerosol parameters and cloud particles are carried out on 5-20 long-haul aircraft, and IAGOS-CARIBIC, where once per month an instrument container is flown for four intercontinental flights to measure 75 trace gas and aerosol parameters (cf. Appendix). IAGOS is part of the European Road map for new Research Infrastructures (ESFRI) and preparation of the legal framework for this new infrastructure is currently funded by the EC under FP7. The goal is to establish IAGOS as an International Association in 2013. In addition, the participating institutes from France, Germany and the U.K. have applied for long-term support as part of their national road maps. The French proposal was already accepted and the German proposal is under review by the German Council for Science and Humanities with a decision expected in early 2013. As the participating institutes expressed their commitment to provide at least half of the operation costs, the measurements are secured to continue at least on a minimal level, including operation of instruments in IAGOS-CARIBIC and on about five IAGOS-CORE aircraft, and the continuous provision of data to the IAGOS database (http://www.iagos.fr/web/). 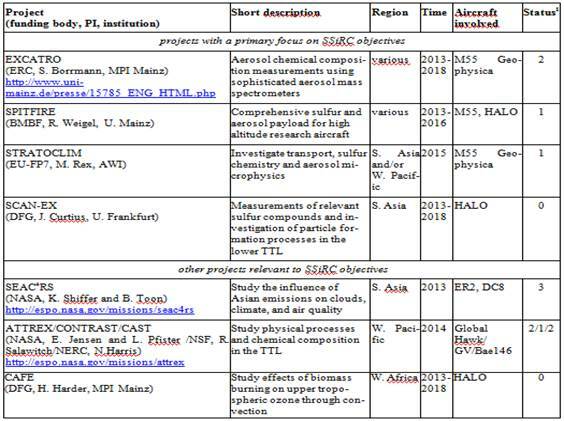 Plans for new instrument development within the next four years include SO2 instruments for IAGOS-CARIBIC (MPI-C, Germany) and IAGOS-CORE (DLR, Germany), an aerosol extinction instrument for IAGOS-CORE (FZJ, Germany) and an aerosol mass spectrometer for IAGOS-CARIBIC (TROPOS, Germany, proposal to DFG pending). Data from the new instruments can realistically be expected from 2015. Measurements of vertical profiles of DMS and CS2 are lacking. Size-resolved aerosol particle measurements below ~150 nm particle diameter are lacking. A compilation of a comprehensive list of in-situ observation capacities (instruments/methods) to address SSiRC relevant science questions and to identify further needs for new instrument developments is missing (cf. Appendix). Availability of high-altitude (> 15 km) aircraft measurement capacity (cf. Appendix) is not guaranteed. Funding of regular long-term in-situ measurements by balloons and passenger aircraft is only partly secured.